Size please take "Product Description" below for reference. Material: Soft and comfortable cotton blend fabric/PU Leather. 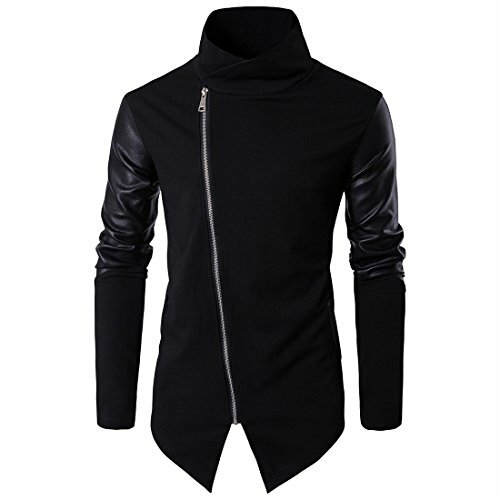 Design: Asymmetrical hem,Faux Leather Long Sleeves,Stand Collar, Front Zipper Closure,Lightweight No Lining, Bomber Style Jacket, Slim ribbed hem and cuffs for a clean look. Size: Standard US size. Please refer to the Size Chart in the Product Picture before Ordering. Feature: Streetwear hip hop style t shirt, fashion long sleeve zip shirts, novelty and stylish clothing. Wash instructions: Hand wash Cold,Soft Machine Washing,Hang or Line Dry. If you have any questions about this product by Tristin, contact us by completing and submitting the form below. If you are looking for a specif part number, please include it with your message.